Reading the diaries makes me aware of my own diary habit. I’ve been keeping a journal since the fourth grade. The first one was blue, with a lock and key, and I wrote sporadically, always telling the absolute truth, no matter how boring, and most of my life was pretty boring–or so I thought. When I look back, it is surprising how much detail I managed to capture in those looping cursive letters. “Today I went to Grandma’s house. Merry and I played with Anne. She is going to have puppies,” I wrote, and I remember the husky who had such a cheerful smile. I remember the puppies tumbling over my lap. Just as I remember my life, Pepys creates the world of his times in daily, ordinary details. The days and days of rain that ended up flooding his main floor–and gives me the detail of a dreary stretch of weeks when the Portuguese queen had just arrived in England and lends atmosphere. Some might say that blogs and social media are creating the same sort of record of our lives, and it is partially true. But social media tends to be fragmented and scattered, often a recounting of things others liked or didn’t like, and details out of context–a meal eaten in a restaurant you will never visit, the new chair of someone you’ve never met. Journals and diaries contain the context of the diarist and her times, her viewpoint, a record of opinions as they rise and fall and twist. Journals are more powerful because they are deeply personal. They’re not meant to be art or even to be shared–and therein lies the pleasure. They are private, and that means the writer is entirely free. The rules of my journals have been fluid, but fairly consistent. I don’t have to write every day, though I like to see at least one or two a week at a minimum. There is no attempt to write well, particularly–I’m not writing for others in those pages, only myself. I never embroider the facts, but that doesn’t mean they are necessarily an accurate record. I only have my own viewpoint, after all. I can only write my own interpretation of events. We’ve had to be aware, in our writing of Fierce Artifice, of the fact of Pepys’ crush on Barbara Villiers. It colors every paragraph he writes about her. He also hears a lot in gossipy sessions at the local pub and interprets the tidbits of fact in his own way. But it is his accurate record of his own thoughts. And then I made a change. Recently, after a stint writing entirely on the computer (then printing and hole-punching the individual sheets of paper and storing them in loose-leaf notebooks), I needed to look something up from a trip and noticed that whenever I wrote long hand in ordinary notebooks, the writing itself was better. So I’ve been buying Moleskines* again, always my favorite. Lined, with a pocket in the back. I like black covers because I’ll always collage something on the front. This was done in a hurry because I was leaving for Texas and didn’t want to bring a nearly full journal. I have lost them every now and then–two within a year, one on a train in Italy, the other in cab in New York City, which are at least glamour places to have lost them, but of course, I was recording the sights and sounds of my travels, so the losses were more acute. One thing I’ve noticed recently is that the practice of journaling has given me an acute sense of boundaries. Novelists, especially those of us who write from deep character, are required to create a powerful sense of intimacy with the reader. I do that–dare I say we all do that–by digging into my own life, self-examination, observations of others. Half of everything I write in a novel is made up, conjured out of observations or conjecture. The rest is mined directly out of my own life and thoughts. The trick is to keep the line obscured, to create intimacy without losing privacy. Only my very closest intimates can guess what is my life and what is made-up, and I work hard to keep it that way. For those of us who do this kind of work, social media asks us to peel away another layer of protection. To be authentic, a Facebook post needs to be something I’m offering you, which means creating a pool of experiences I can share. Columns like this also ask me to be authentic, and here’s thing thing: I love it. I love finding these things to write about, showing up to talk about observations and life and the universe. I’m a communicator. I’m born to do it. 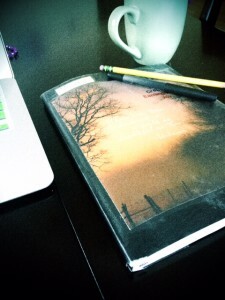 It is the practice of my journals that has allowed me to understand where my boundaries are. In my journals, I do not have to be thoughtful or kind or even a good writer. I am thoroughly myself, sometimes whiny, sometimes enraptured, sometimes arrogant, sometimes lost. I sometimes write pages and pages, other times just a paragraph. I write out plot problems and lists of things I want to do the coming month. It’s ordinary, and maybe sometimes beautiful, but what it allows is a place for me to be just to just be Barbara, alone with myself for companionship, not performing. A blog, a Facebook post, an Instagram picture–all of those things are performances. It’s a distinction that gets lost sometimes, as people share the details of their lives, constantly, often in a shallow way. (No judgment–I do it, too.) A journal is private, it is personal, and it is the record of a single life in all of it’s messy glory. I hope that doesn’t get lost, that we will still have the honest thoughts of our generation, recorded in private journals all over the world. Do you or have you kept a diary or journal? Does it help you? Will you burn it before you die, or leave it for those who might want to read it someday? You had me at Restoration drama. Very much looking forward to reading this. Then you had to mention Moleksines, which I utterly adore. I love writing in notebooks. The word, “journal,” has always bothered me, though I can’t explain why, so it’s not one I usually use; to me, they’re notebooks, and I have several of them, each with their own purpose. My daily pages book is a gorgeously illustrated volume by Punch Studio. Every weekday, I fill two pages with free writing, whatever is in my head at the time, and the end of the second page is the end of that entry, period. I have a softcover Moleskine with dot grid pages that is my all purpose book in my computer bag. This goes on the road with me, and it gets everything. Took me a while, but I found that if I can use the grid as a guideline to put each thought in an individual box, which I can then color in with highlighter or colored pencil, my brain holds the information much better than it would on a plain blank or lined page. Definitely for my eyes only; I do like having writing that isn’t for anybody else, and the thought of losing one of these books makes me nervous. These are intimate thoughts. It’s really a treat to play in this world, Anna. That’s a pretty interesting idea on the grid. Might have to try it.